Spring is coming to Cleveland, and that means picture taking opportunities are right around the corner. With a couple new accessories, you can be ready for picture taking fun all summer long. At the Consumer Electronics Show I discovered a couple products that should pump-up your camera’s potential. Most point and shoot cameras are a disaster if they get wet. Similar to a cell phone, one dunking and they’re typically toast. So how do you get those pool pictures, especially the ones where half the picture is below the water level and half is above? Enter DiCAPac, the new waterproof case for your compact or DSLR camera. Basically think of a Baggie with a submarine port for the lense. But, before you get any ideas…a Baggie would not be a good idea. One bump and that seal can pop loose. The DiCAPac on the other hand uses heavy grade soft PVC that enables you to operate the camera and adds a plastic zipper, plus folds, plus a double Velcro system to make sure nothing pops loose in the water. The lense area is UV coated polycarbonate for diffused reflection prevention. In English, that all adds up to clear pictures underwater without a lot of complicated, expensive gear. 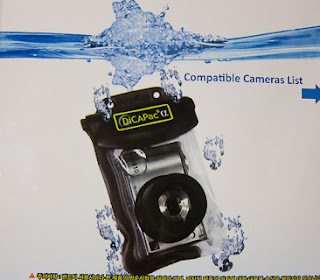 The DiCAPac is waterproof to 10 meters deep so you can take it for some serious diving, not just in the pool. Check their website for a model to custom fit your camera, video camera or smartphone. They even have waterproof earphones so you can watch your YouTube videos and listen as well, all the while underwater. Why you would want to…I have no idea. One model fits many models of cameras, just as our next product does.. If you are a typical digital camera buff, you’ve probably accumulated more than one model camera, upgrading as new models come out. Pretty soon you are facing a closet loaded with battery chargers. Digipower to the rescue. If you still have those old chargers and they use similar batteries, you may be in luck. The Digipower can take their place and give you one compact charger for a raft of camera models. One hour and your battery is ready to go. Using the charger couldn’t be simpler. Merely fold out the plug, insert into an outlet and insert your battery. No adapter or switches to flip or set. A large LCD indicator on the front shows the charging progress. In addition, you get a USB plug on the unit’s side so you can use the same device to charge your smartphone or other USB device. If nothing shows up on the LCD, as happened with one of my batteries, it’s time to retire that battery. Check locally at Radio Shack or HH Gregg, nationally at Ritz Camera, Tiger or PC Richard & Son, or on-line at Amazon for other models as well as Nikon. Best Buy will also start carrying the units in late May.